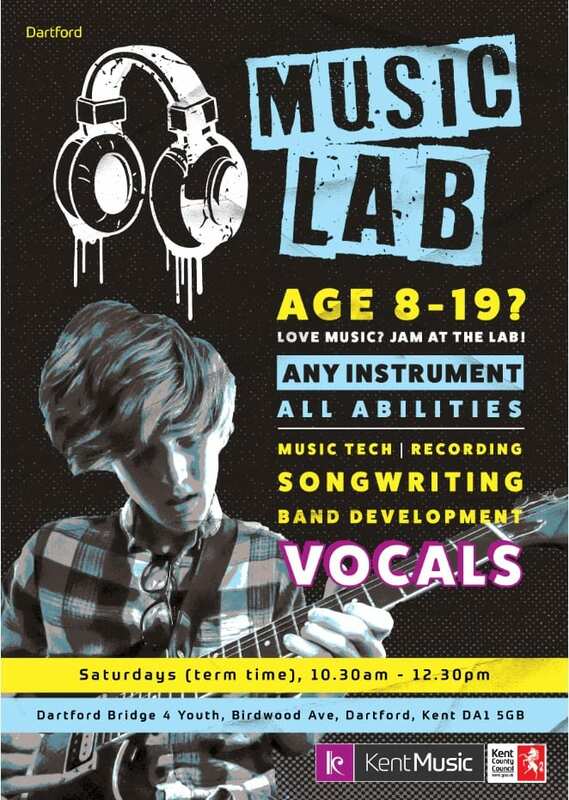 Dartford Music Lab is a creative space for young people aged 8-19 to work on band development, music technology and production, singing and instrumental skills, songwriting and more. No matter what your style, ability or interest – you might want to play pop, rock, urban, folk or classical music, or might be interested in music tech or sound engineering – you’re welcome to join. If we don’t have what you want, tell us and we will provide it! The Music Lab is committed to Youth Voice and we want our members to have a big say in how it develops and what it does each week. All sessions are supported by a team of professional tutors and youth workers. The Lab meets at the ‘Bridge 4 Young People’ (Dartford Youth Hub), a purpose built youth facility that provides a range of equipment and great spaces for young people to make music and explore their interests. Youth workers support this weekly activity, working closely with the Kent Music ‘music’ leaders and the young people attending to build a friendly and creative music programme for all. When dropping off and picking children up, please use the KCC spaces in Bell Terrace. We welcome enquiries for instrumental lessons at Dartford Music Lab. Please use the button below to make an enquiry.